A: High strength PC injection moulding. D, Impact resistance, abrasion resistance, heat resistance, low temperature resistance. E, Can be used in the maximum temperature 80°C and the minimum temperature -35°C special environment. F: Size: 110*110*40mm, cable thickness 2mm, length 1.8m available for padlock shackle maxmum diameter 7mm. Can be locked out by 2pcs padlocks. Our range of cable lockouts are ideal devices for securing most valves, isolators and industrial machines, Manufactured from an impact copolymer polypropylene with stainless steel internal parts and PVC coated steel cable, accepts 4-8 padlocks for multiple lockout applications. BO-L12 : Adjustable cable lockout with 1.8m,3mm diameter steel cables. 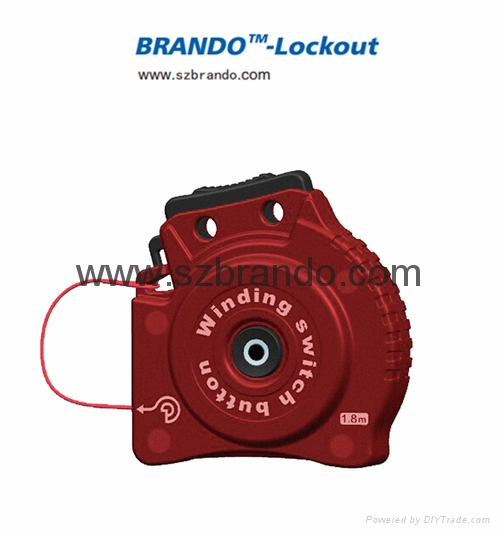 BO-L01 Multipurpose Cable lockout with 2.4m cable as standard . BO-L21 Economic Cable Lockout 1.8m & 3m.